Goals and strategies are useful, but nothing trumps calling. Leadership is the calling to bring your best self in service to others. Define success in terms of personal excellence, not results. Achievements are less important than calling. People with a calling don’t need a cheering crowd. Traditional praise is like water off a duck’s back to people with a calling. People with a calling never feel entitled – they feel compelled. People who feel a calling work harder today than they did when they started. 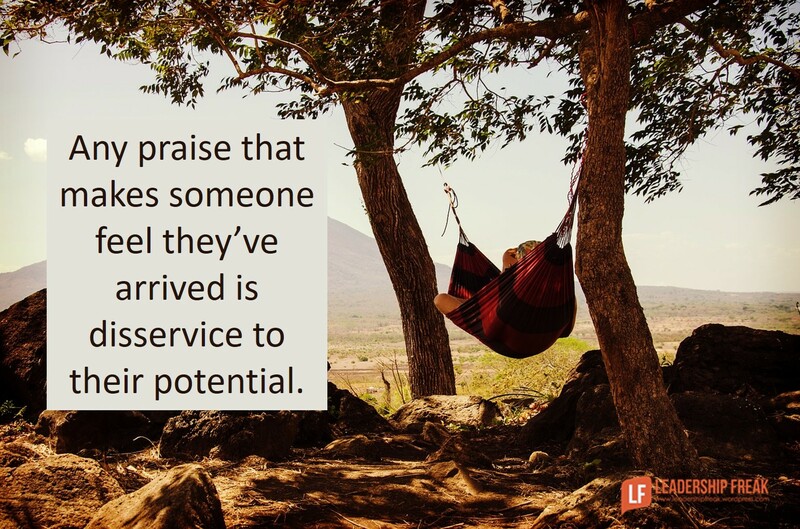 Any praise that makes someone feel they’ve arrived is disservice to their potential. People with a calling hear words of praise and keep on sweating. Tell a great musician they’re great and they know they aren’t all they could be. Praise people for their hours of practice, not for the hour they played on stage. Labor pains come before your best self emerges. #1. Define your best self in your own terms, not the terms of others. Your lasting contribution is deeply connected to your authentic self. #2. Glance at where you’ve been. Stare at where you’re going. #3. Three or four times a week, push yourself into discomfort. Ease chokes your best self, but stress ignites growth. Think of a fitness trainer who yells, “Give me one more,” when you’ve expended your ‘best’ effort. The time to ease up is tomorrow. #4. Let yourself be incompetent. See competence in others. Everyone around you is better at something than you are. We seldom grow with a spirit of ‘better than’. #5. Ignore shallow praise. Your best self hasn’t arrived. Your service is incomplete. How do you define the leader’s calling? How might leaders develop their best selves? Hmmm…was just in a conversation yesterday with a young administrator that I am mentoring about my motivation and praise. This is great Dan! Thanks KF. Keep on mentoring! I’m enjoying reading your posts Dan. Thanks! A compelling and passionate desire to improve the status quo–including themselves, their students, their business, their community etc. By reading Dan’s blogs with openness, reflection, and a willingness to try and tweak new behaviors. Thanks Paul. Love your insights on calling. I think the idea of ‘improvement’ is core to any definition of calling. How could we think of something as a calling if there isn’t some aspect of betterment. The outward focus in your insights also seems important. It’s always easy to read your blog posts and think of others within my organization. It’s much more challenging to reflect on my own actions. Achievements really are less important than calling. Thanks Jogo. You nailed it. Perhaps one of the essential habits of leaders who grow is to begin with their own need for development. Ouch! Dan I have been reading your blogs for years I receive via email weekly this is by far most powerful to me. Recognition, achievements cannot define what ignites you. Thank you! This spoke reality this morning. Wow! Thanks Danette. It’s a real pleasure to hear from you today. Thanks for being a subscriber. Dan I have been following your blog for a few months, but I have to say this morning’s post is my absolute favorite! I am blessed to have a calling rather than a career, and every day my goal is to be better, more effective, and to help others feel inspired and encouraged. Thanks so much for what you do! Thanks for being a follower of the blog, Bree. Your comment will likely be an encouragement to other readers. “Glance at where you’ve been. Stare at where you are going.” The rear view mirror/windshield analogy in words. One of my favorites. Need to make a meme for that! Thanks Vicki. Great connection. Glad you stopped in. Wow! That was POWERFUL. Basically, LIFE is not about YOU. But SOMETHING GREATER than YOURSELF that you will always reach for. Thanks ZK. Yes, one of the great growth points for leaders is the realization that it isn’t all about us. I like the idea that we develop ourselves so we can serve others. In that sense there is an inward focus. Service addresses selfishness. “People with a calling don’t need a cheering crowd. Thanks Ken. Glad you stopped in today. Dan, this is one of your best blogs ever, and you know I have been a fan for a long time. Without a “calling” one will never be a true leader. Thanks for your great work! Hey John. Great seeing you here. Hope you had a great holiday with the family! Love your insight – Without a “calling” one will never be a true leader. Brilliant post as usual, Dan. I always think of servant leaders when I read your posts. Some of my friends asked why I bothered with grad school plus 3 jobs when I could be retiring. As you say, it’s a calling. We can learn something every day and enhance our skills. We can all be leaders even if we don’t have the official title. Thanks williamswriteswell. Your comment got me thinking about a need to make a difference. I think that’s one of the indications of calling. A calling is a need to make a difference. As you mentioned ‘wanting to make a difference”, the burning desire one has to throw themselves into the fire of leadership! You just do it, because that’s the calling! Thanks Tim. Jump into the fire. Like many others–I read the blog everyday, I share it with others, I often share it on LinkedIn, but I don’t usually comment. Today was one of my favorites and really hit home with me. I love the idea of a calling and I am blessed to walk in mine. No one has to movitvate you when you are walking in your calling. I really like number; the challenge to intentionally push yourself. There is no telling where we can go, the sky is the limit! Thanks for this blog—I look forward to it everyday! Thanks Toni. Kind of you stop in today. The idea of pushing yourself is another one of those ideas that rolls of the tongue easily, but is really hard to implement! I’ve found the times I push myself the most are when someone else is part of the journey or others are counting on me. It’s those times that I tighten my grip and stay in the saddle. Hmm. Without achievement, nobody is going to give you the chance to lead anything. Unless you have capability to back up calling, nobody is going to let you run a bath, never mind a team. Thanks Mitch. No one would suggest that achievements don’t matter. Thanks for the reminder. I suppose you could also say without personal excellence, what’s the point of achievement. The thought and preparation that went into this was incredible. It is evident in your work. Best one yet Dan! Wow.